Well it appears that we all have one thing in common ........ An utter embrace of disarray. 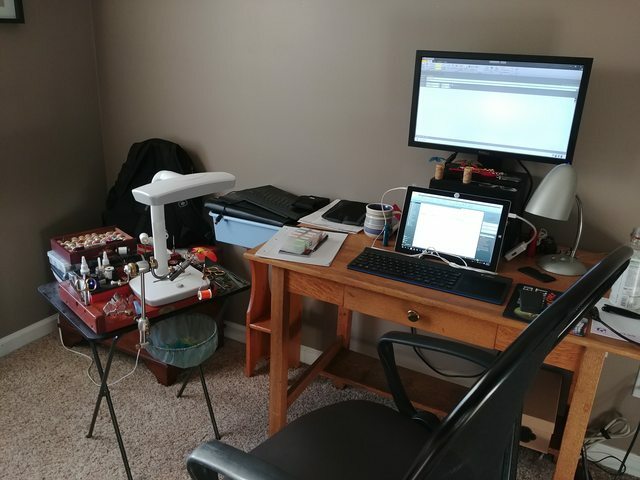 I have 2 areas where I have the ability to tie flies, however for at least the past year I've tied almost exclusively on a TV tray that I bought so I can be in the same room as my wife while we watch movies or she crochets. In the first picture I've moved it into the spare room next to my desk. 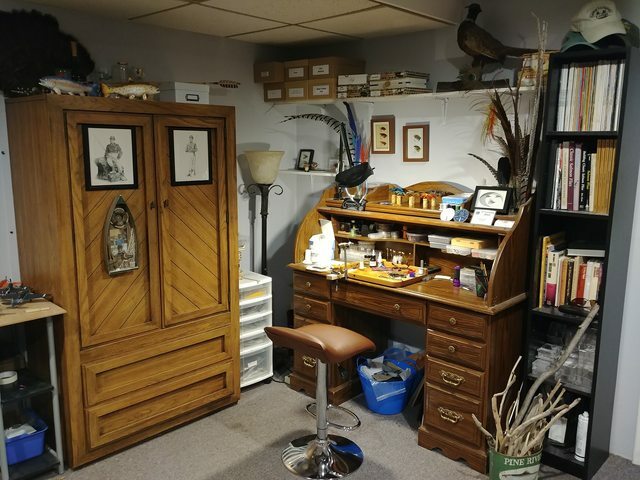 The other area is my basement which I had initially set up to be my primary area, however love prevails and I prefer to spend time with my wife. The spare room of course, LOL. We'll always make room for you George, always. Wait ..... You're giving Jon Linda's room? Georges basement is nicer than most peoples main living area. I just want to clarify. The only thing lacking was a nice Andes chocolate mint on the bed. Maybe next time. Andes??? Only Godiva here old buddy. You guys are too much! Haven't been here for awhile...looking forward to participating more. Anyway, this is my desk 5 minutes ago. It always looks this way. That, is a functioning set up! Is the fly holder magnetic? Stephen, I'm ok, waiting for the spinal cord stimulator implant on 1/5. And yes, Val, that is a magnetic holder. I think it's original purpose was for kitchen knives or something. I love it. Are those containers on the wall for dubbing Matt? Dave, yes...small tin containers, glued a magnet to the back and ran some steel trim coil around the top of my tying area and just stick them up there. Better than the bags, which I did for years. I made myself a nice spot to tie down in the cellar so I have lots of room for stuff lol.